The Optimum VAC2 Air Vacuum Blender is an amazing blender set far apart from the world of traditional blenders. Air is removed prior to smoothie blending preventing oxidisation and the destruction of nutrients. Still with all the features of a traditional blender, the Optimum VAC2 Air Vacuum Blender is a must have! Folks, today I want to talk to you about the latest addition to my kitchen gadgets, the Optimum VAC2 Air Vacuum Blender. This is no ordinary blender. It’s a truly revolutionary blender. The removal of air from the jug prior to blending creates smoothies which stay fresh, remain full of flavour and provide you and your family with the very best in optimum nutrition. With the additional capability and convenience of traditional blending the Optimum VAC2 Air Vaccum Blender is the MUST HAVE healthy living solution to make the very best smoothies possible. I appreciate that deciding what blender to buy is always a difficult decision but after having fully tested out the Optimum Vac2 Air Vacuum Blender for you and reading my detailed review below I hope that I can persuade you to consider this blender as the very best option that’s currently on the market! I can’t tell you how many blenders I’ve been through in my time. I use them so often for soups and smoothies that they frequently burn out! Previously, I always went for whatever blender would just do the job. I thought that my previous blenders gave reasonable results, I mean everything seemed to have been blended OK before, right? Wrong! Since starting to use the Optimum Vac2 Air Vacuum Blender, I’ve noticed such a big difference. My smoothies are so smooth, that even ones made from fruits with seeds, like raspberries, are velvety smooth. As for my soups, well they’re all amazingly creamy, with no bits of vegetables left in the bottom! 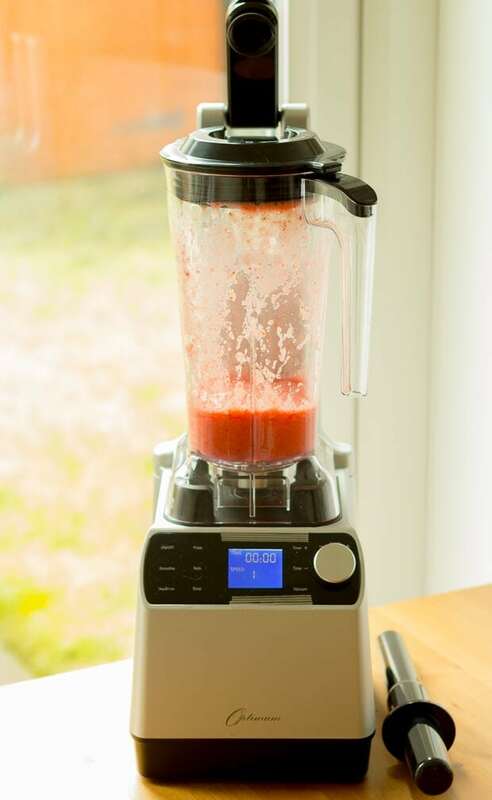 The blender comes with a few preset built in functions (seen in the picture above) – ‘smoothie’, ‘vegs&fruit’, ‘pulse’, ‘nuts’ and ‘soup’ which are operated by a mere touch of a button. You can of course use the blender manually by setting the duration and speed yourself. It’s completely flexible so that you can suit it to your own specific needs. Now can we talk about cleaning this blender? This has always been another bugbear of mine! Well here it could not be more simple. 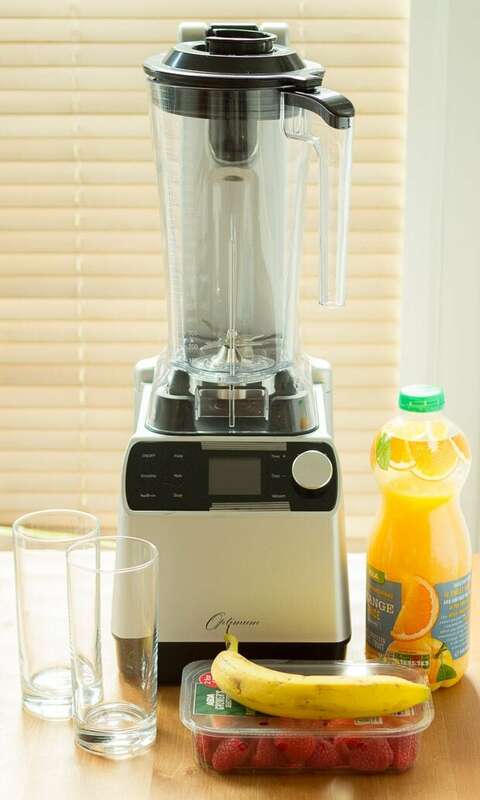 All you do is just rinse the jug out, add a drop of washing up liquid, some water and then run the blender on high speed for a few seconds (all detailed in the easy to follow instruction manual that comes with your blender). Then rinse with warm water and allow to air dry on your draining board. No longer are there different parts to dismantle and wash separately! However let me not just try and persuade you how good this Optimum VAC2 Air Vacuum Blender is from an operating point of view. Let’s talk about all the different kinds of things that this blender is capable of making! Yes, this blender does so much more than just making soups and smoothies! This blender is also handy for making dips, spreads, dressings and marinades. It also has no problem grinding grains (I did oats to make oat flour) and nuts can also be ground to make nut butters. AND it can actually make dough too! At the time of writing this review you can buy one of these blenders on 0% interest for 6 months. For more details, videos, specifications and to purchase the Optimum VAC2 Air Vacuum Blender USE THIS LINK. What Can You Make In Your Optimum VAC2 Air Vacuum Blender? You don’t just get a blender with an instruction manual here either! Not only can you be sure that you’ll never run out of what to do with your blender, you’ve a whole selection of meals to make too! As a Froothie Ambassador, the UK distributors of Optimum blenders, if you order the Optimum Vac2 Vacuum Blender using my link in this post, then I can offer you free postage and packing if you add my 4 digit delivery code 5276 into the comment box on ordering, or mention it if you are ordering by phone. The delivery charge will be credited back to your card. 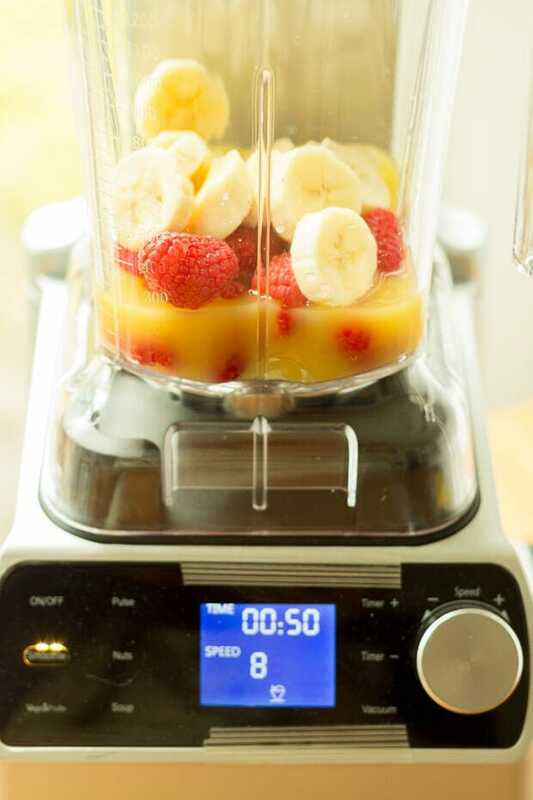 Check back here next week where I use my blender to make one of my favourite (and easiest) Banana Raspberry Orange Power Smoothie recipes! You can expect lots more smoothie, soup and other recipes here too using this amazing piece of kitchen technology! Disclosure: I was sent the VAC2 blender to review. If one is bought through my affiliate link I will gain commission. All thoughts and opinions are my own. You sold me on the idea of how easy it is to clean this blender! I hate (I mean hate!) cleaning blenders. Not only do you have to take the whole thing apart, but you have to hope you don’t cut yourself on the blades. I’m intrigued by the idea of the vacuum blender here. It makes sense, but I’ve never seen one of these in action. I’m totally going to remember this post for when we need a new blender! Thanks for sharing, Neil! 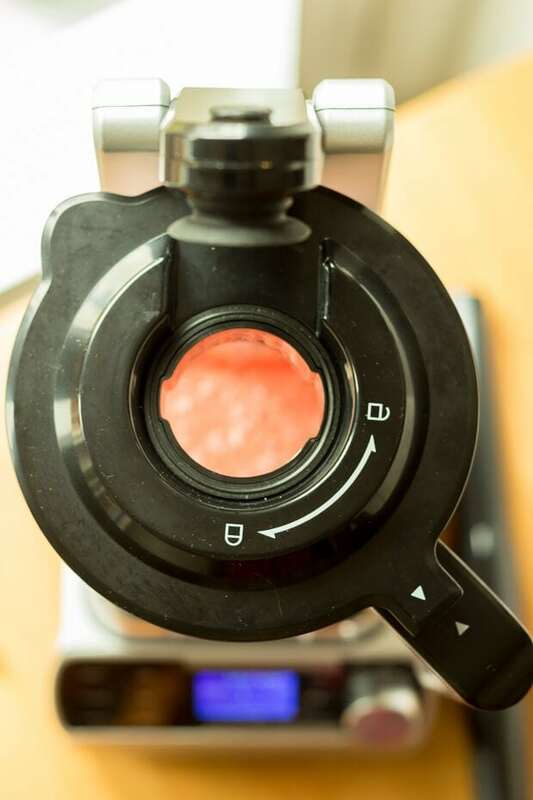 I remember seeing a video of this Optimum Vac2 Air Vacuum Blender in action last year – the “froth” that most blenders leave at the top of smoothies was non existent with this one! It was amazing to watch! Congrats on being a Froothie Ambassador, Neil – hoping you and lady Lynn are having a great week so far! I’m really enjoying the Vac2. I’ve tried a few Froothie blenders now and I reckon it’s the best yet. Thanks for your blender article. It was interesting to read about your thoughts on this blender. I am looking for a new blender but haven’t yet decided. I’ll bookmark this page and come back should I decide to purchase!